Uva ursi has traditionally been used as a medicinal herb but has little to no nutritional value. The medical uses are not scientifically validated, so caution is recommended. The name of this herb means "bear-grape" in Latin, referring to the fact it is loved by bears, which is also reflected in the alternative name "bearberry." Uva ursi is native to Europe and is widely distributed in the arctic. It is commonly found in Europe, Asia, and North America. The plant grows best in damp conditions and is generally found in undergrowth, heathland, and grassland. Alleviating bladder and kidney infections. 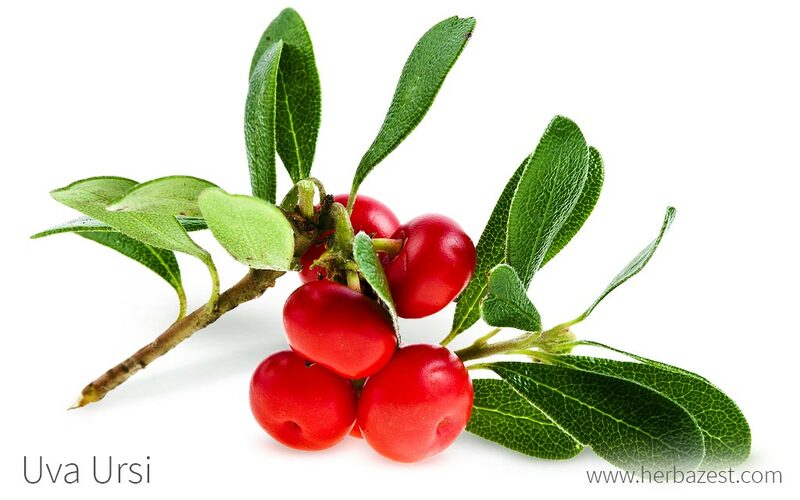 Uva ursi has been traditionally used almost exclusively for supporting urinary health. Arbutin is the main active compound found in uva ursi, and it is regarded as responsible for most of the herb's antimicrobial, astringent, and disinfectant properties. In vitro studies of human melanocyte cells (located just underneath the skin) exposed to arbutin reported decreased tyrosinase activity - tyrosinase is the enzyme responsible for controlling the rate of melanin. There was little evidence of toxicity. UVA URSI OFFERS ANTIMICROBIAL AND DISINFECTANT PROPERTIES. Some in vitro studies have shown arbutin to possess a mild to moderate action against overgrowth of Candida albicans fungi, as well as Staphylococcus aureus and E. coli bacteria. Herbs that are commonly used for preventing and treating urinary tract infections are blueberry, echinacea, and cranberry. General side effects reported include mild nausea, vomiting, irritability, and insomnia. The liver-damaging effects of uva ursi can be attributed to hydroquinone (HQ), a compound that arbutin is converted into inside the body. Uva ursi has also been linked with albuminuria, hematuria, and urinary casts. Pregnant or breastfeeding women, as well as those with high blood pressure, Crohn's disease, kidney or liver disease should avoid taking uva ursi completely. Due to its liver toxicity, uva ursi should not be taken for more than three days at a time, and always under a doctor's supervision. Dried. The dried leaves of uva ursi can be used to prepare herbal remedies. Infusion. Uva ursi dried leaves can be steeped in hot water and taken orally to promote bladder health; however, the effectiveness of this preparation is yet to be corroborated by scientific studies. Tincture. This concentrated form extracts the medicinal properties of uva ursi into an alcoholic solution. It needs to be diluted in water or juice. Capsules. The dried and powdered leaves of uva ursi are marketed in supplemental form to support urinary health. A standard dose of three daily capsules is recommended. However, it is advised to read the labels, since there are many brands and different concentrations of the herb. There is little to be gained from eating the fresh uva ursi fruit, and the excessive intake of supplement forms can be dangerous. Consult with a qualified physician before start taking uva ursi in medicinal amounts. Because the unpalatable taste of its fruits, fresh uva ursi is rarely found. However, uva ursi dried leaves can be purchased, in bulk or as teabags, through online retailers or in specialized herbal stores. Extracts and capsules can be found in various online herbal stores, and marketed exclusively for urinary health support, as well as for the treatment of urinary tract infections. DUE TO POSSIBLE LIVER TOXICITY, UVA URSI SHOULD NEVER BE TAKEN FOR MORE THAN FIVE DAYS AT A TIME OR MORE THAN FIVE TIMES PER YEAR. It is difficult to cultivate uva ursi as a garden plant, as it does not grow well after being transplanted from the wild, although propagation by cuttings seems to be more successful. Uva ursi grows in damp conditions, preferably under a neutral to slightly acidic soil. The best soils for uva ursi are well-drained, sandy, or gritty, and it likes exposed open sites. Once established, this plant is extremely drought tolerant and should be placed in full sun, although it can also tolerate light shade. Uva ursi is usually regarded as tolerant to most plagues and diseases, and it is rarely attacked by deer or birds, although it is susceptible to root rot and mildew, especially in southern areas. Uva ursi is a small, wiry, evergreen shrub with bright, green leaves. The branches grow flat along the ground and are a reddish-brown color. The uva ursi flower is pink and bell-shaped, and its appearance is followed by bright red berries. One plant can cover 6 - 12 inches (15 - 30 cm) of ground. Uva ursi (Arctostaphylos uva-ursi), also known as bearberry, belongs to the large Ericaceae family, which encompasses about 3500 species across 125 genera of small, trees, shrubs, and woody vines widely distributed around the world. The genus Arctostaphylos comprises 50 species, many of them are commonly confused with uva ursi. These include alpine bearberry (A. alpina), Santa Cruz manzanita (A. andersonii), and Mt. Diablo manzanita (A. auriculata). Several cultivars of uva ursi have been developed, mainly for ornamental purposes, such as 'Massachusetts'. Arctostaphylos uva-ursi is sometimes referred to as Arbutus uva-ursi, its old scientific name. The history of uva ursi is mainly medicinal; the herb has little nutritional and absolutely no culinary value. Various historical peoples have used uva ursi since the 2nd century, most notably for bladder and urinary infections. Documents have been found from Wales dating back to the 13th century mentioning the use of uva ursi as a medicinal agent. For the Native Americans, it was also a popular herb to smoke with tobacco. Missouri Botanical Garden, Arctostaphylos uva-ursi 'Massachusetts'.